A gorgeous novel of family life, You Know Who You Are is the story of the Vine family, Arthur, Alice, and their three children. The eldest, Will, is well-mannered and academically driven. The youngest, Cara, is a sweet little charmer. Jacob, the middle child, is less sure of who he is. He’s funny, he’s impulsive, and he is often held hostage by his urges to make chaos. But when their mother, Alice, falls ill, Jacob begins to experiment--guiltily, nervously--with the special freedoms conferred on the motherless. 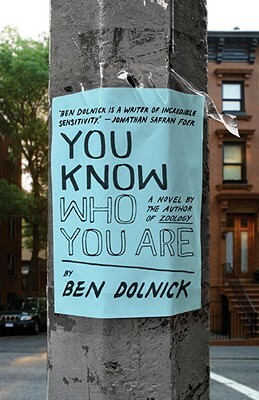 Ben Dolnick grew up outside of Washington, D.C., and currently lives in Brooklyn with his wife. He is the author of a novel, Zoology, and his work has appeared in various publications, including The New York Times and Five Chapters.